Insurance Claim goods are hot items in the auction market, often representing unbeatable value. So, what are they and why should you consider buying products from insurers? Here’s a quick overview – after you finish, be sure to keep an eye out for massive insurance claim clearances going under the hammer at Lloyds Auctions! What are insurance claim auctions? Insurance Claim auctions offer insurers a way to sell product and recover costs associated with a claim. Businesses subject to flood or fire damage for example, often write-off all goods held on the premises and need to clear the building for restoration works. Insurance companies are not in the retail business, so often move bulk stock through auction houses to achieve a fast turnaround at fair prices. Goods often include big brand items such as TV’s, computers & tablets that are sold in original condition. They are provided to auctioneers as-is, where packaging may have been exposed to elements such as possible water or smoke damage. Often products are absolutely untouched and undamaged. This means that for those who have a strict budget or who want a Big Brand item for a lot less, Insurance Claim Goods auctions are the way to go. Why should you buy insurance goods? Insurance Claim goods are often in original condition or have only minor cosmetic damage, yet are mostly sold at less than 50% of their retail price. More often than not goods sold subject to insurance claims have their manufacturer warranty voided. Even though sold with no warranty attached, these items often have no defects and represent great value. Goods from electronics, appliances, white-goods, power tools, audio equipment, even through to designer suits and clothing have sold quickly through auctions here at Lloyds. Still a little wary? Here at Lloyds we have testing facilities available for our Insurance Claim goods. Our customers are welcome to come and have a look at goods before they buy and even test them with us. For anything that has been exposed to water, Lloyds tags and tests personally to ensure that the item is in perfect working order. We always recommend an inspection before buying, but as a leading auction house, we know our vendors provide us with quality products. Saturday the 22nd April saw $100K worth of Audio, Devices and Photography go on auction with no reserve. These items were all part of an insurance claim and were all part of highly recognizable brands such as Beats, Sony, Apple and Samsung. I-pads, I-pods, mobile phones, cameras and fitbits were just some of the branded items that went without reserve and for a fraction of their retail prices. They were subject to an insurance claim due to smoke exposure. The majority of these items were new in their box – untouched. All items had adjoining photos of the actual product in box. To recap, new Big Brand products with no fault often sell for less than 50% of RRP. These include but are definitely not limited to; whitegoods, electrical items, power tools and appliances. 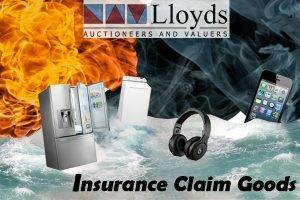 Lloyds offer additional assurance through testing of water damaged items, the option to personally view and check items in our warehouse, as well as high customer satisfaction from many successful Insurance Claim Auctions to date. It doesn’t get much better than that! Keep an eye out for our Insurance Claim auction this weekend on Saturday the 29th April which will include whitegoods and appliances!